Sketch two small semi-circles for each naris. 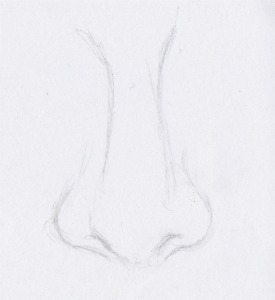 Then, add some lines to create the tip of the nose and the philtrum. You can add color to give your work a three dimensional feeling. Then, add some lines to create the tip of the nose and the philtrum. You can also draw a small curve or a dot to indicate the tip of the nose and not draw the top curve. For the front view draw a shadow on one side or a vertical dash in the middle that just gives a hint of the nose.